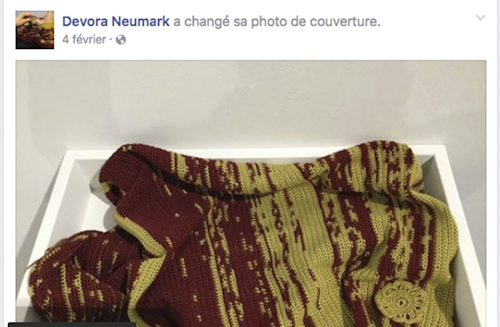 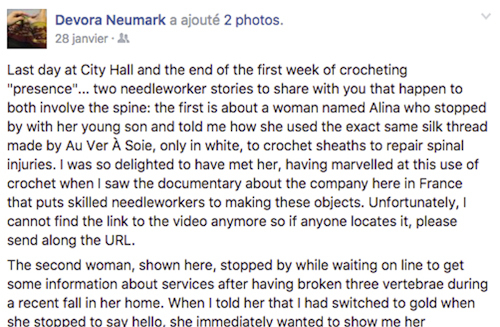 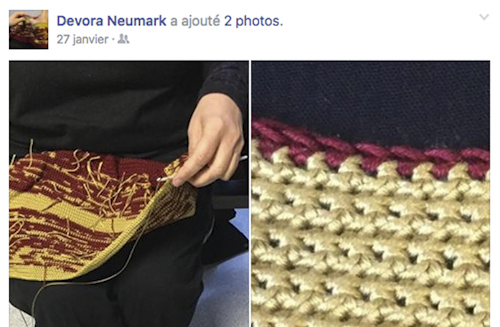 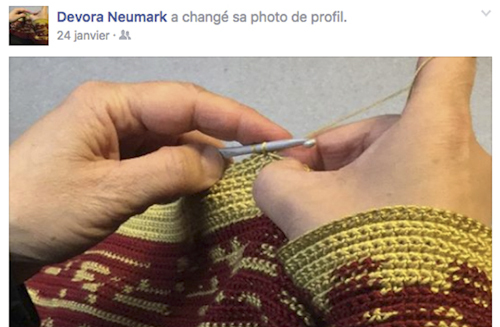 Over a period of eight weeks beginning in September of 1997, I sat on a three-legged wooden bench in various places around the city of Montreal crocheting non-stop. 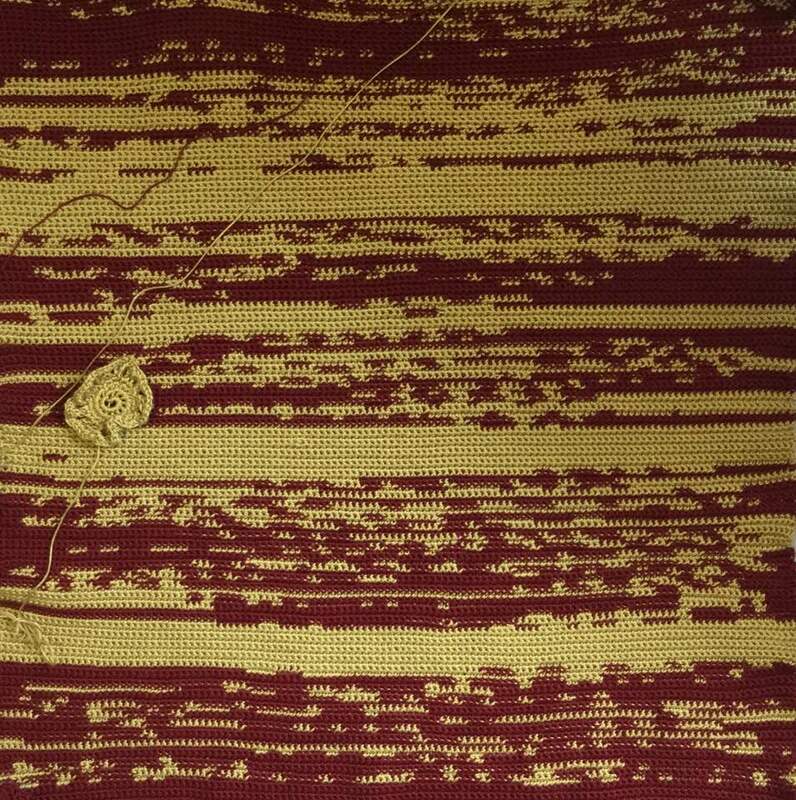 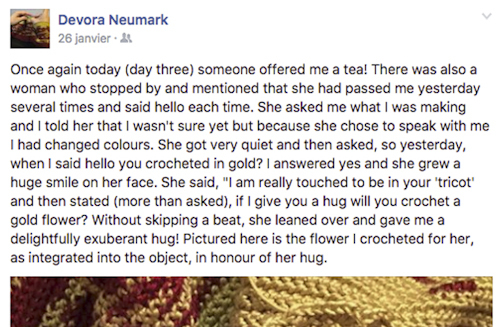 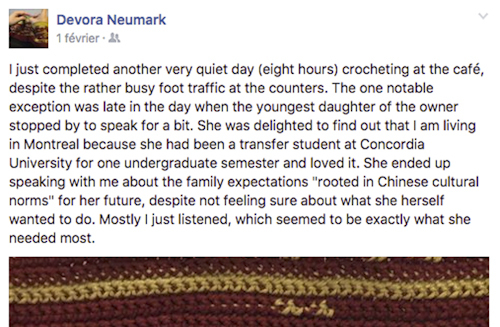 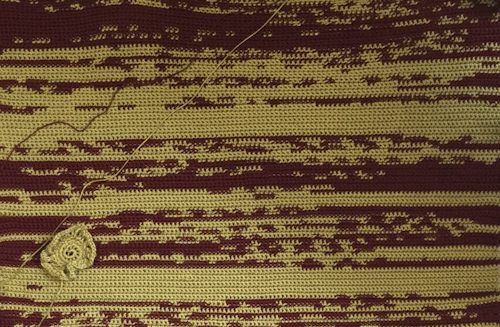 For five hours a day, I crocheted using two colours: fine yellow cotton thread marked the stitches I made in solitude, while purple traced my exchanges with the passersby who stopped to speak with me. 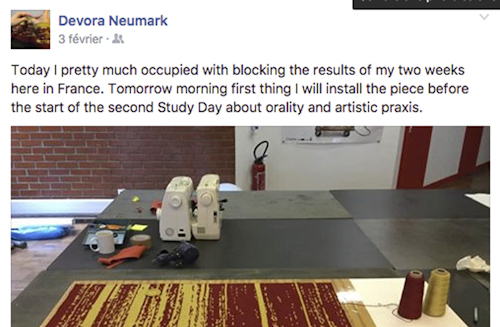 This durational performance emerged not long after the total destruction of my home by a fire set by an arsonist. 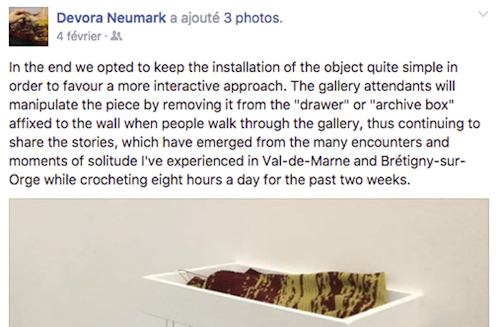 The object I created had no practical use value—in fact I unravelled it completely shortly afterward during the launch of a subsequent exhibition called L'art inquiet. 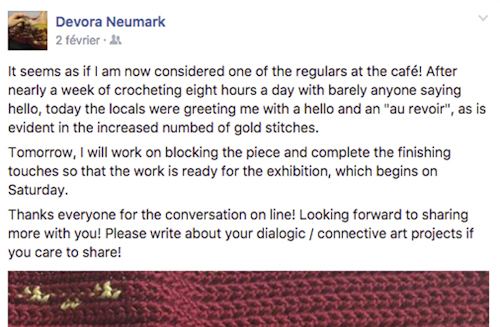 Motifs d'engagement, at the UQAM gallery; it did however serve as a powerful daily meditation bringing me home to the present, vibrantly connected to self and other. 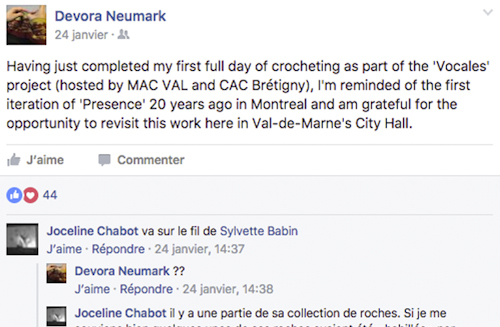 Having been invited to recreate this work nearly 20 years later in the context of CAC Brétigny’s Vocales exhibition, I am keenly aware that living presence is a lifelong practice of personal responsibility and resilience. 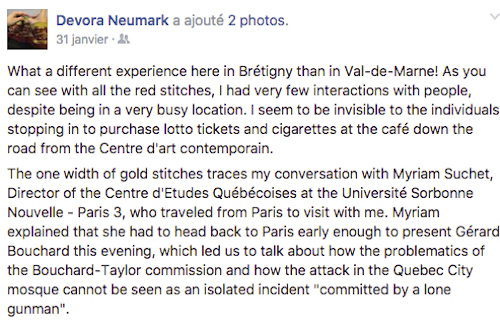 Vitry and Brétigny in 2017 are not the same as Montreal was in 1997, and neither are my personal circumstances. 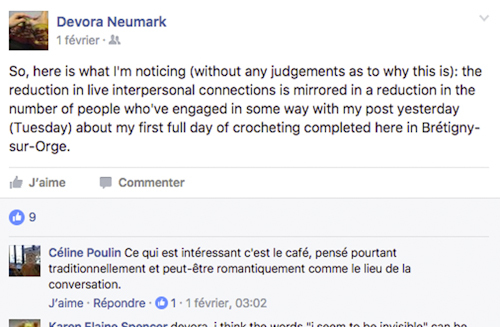 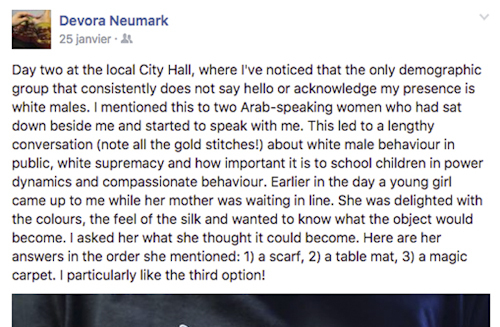 The people I encounter in Vitry and Brétigny will have different stories to share and different experiences for me to stitch into the object thus necessitating a different set of colours and a different material form.